When I walked into Gilman Park in San Francisco's Bayview neighborhood, it was just like that classic scene from the movie Poetic Justice. You know, the one where Tupac Shakur's character, Lucky, enters a park full of people he doesn't know and is accepted with open arms into the Johnson family reunion after introducing himself as "Cousin Pete." 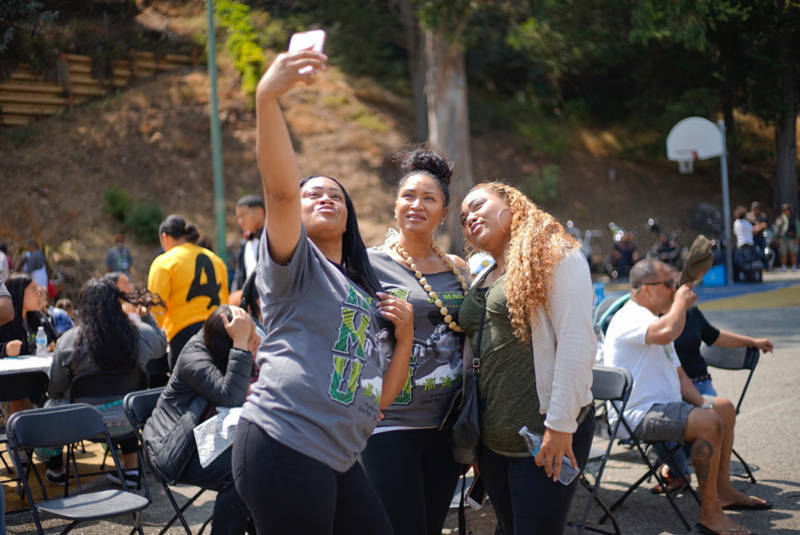 The only difference was that the folks at the 4th annual All My Usos BBQ, a celebration organized by the Polynesian community in San Francisco, opened their arms to me before I had the chance to introduce myself. It probably helped that I was with Jean Melesaine, a well-known photographer, sister of the community and product of the same soil on which we walked. Melesaine hugged people that she called auntie and kissed community cousins on the cheek, introducing me thereafter. I followed along as she moved through the crowd: tall with a warm smile, Canon camera securely strapped over her shoulder, her long black hair braided in two cornrows that draped down the back of her "Polynesian Panthers" T-shirt. Melesaine has attended this annual barbecue for years, but this one was different. Key folks were missing. Some of the people Melesaine expected to see were at the hospital, she told me, alongside Joseph Taeotui, who had been shot multiple times that week. 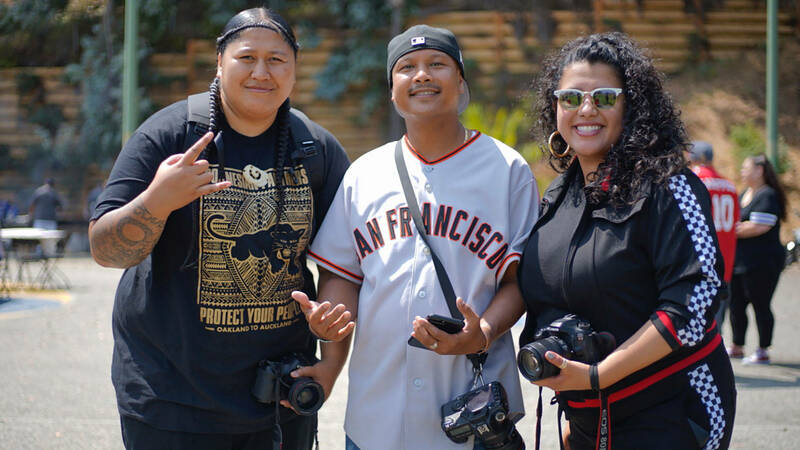 Taeotui, I learned, is also commonly referred to as "Jungle Joe," a community organizer who lived in the trenches and connected with the young people of the community. He helped to organize community events, including this one. 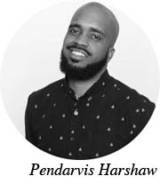 He also worked on anti-violence campaigns; the day he got shot, he was reportedly coming from a community meeting on how to stop gun violence. 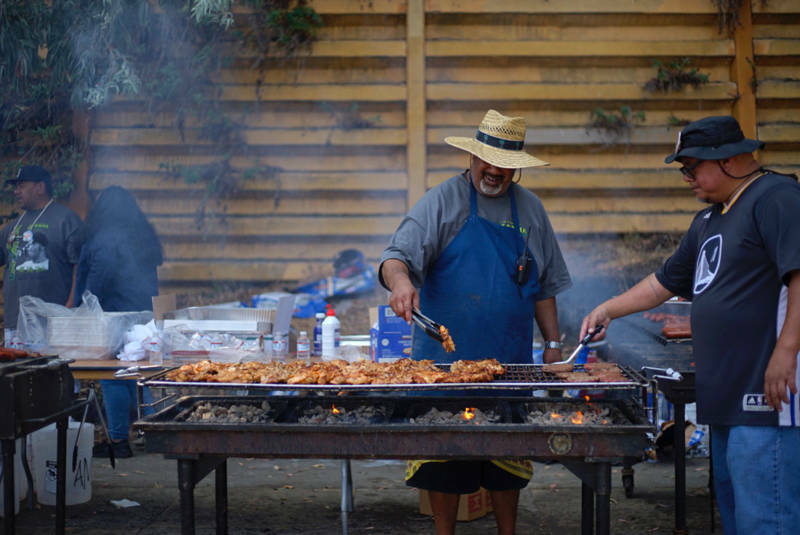 Adding to the heavy hearts around Jungle Joe's life hanging in balance was the recent death of JT Mauia, one of the founders of this annual gathering, who died of cancer earlier this summer. Nonetheless, the sun somehow pierced through the heavy fog of southeastern San Francisco before noon, and gently glistened off the parked motorcycles of the Pacific Savagez bike club. Kids got free haircuts and face-paint jobs. Some folks shot hoops, others played catch with a football. It was the first time I attended a barbecue where a rugby ball was tossed around. Before the food was served, someone turned down the sound of classic R&B as attendees gathered in prayer. The emcee opened with a bit of history. "I'm going to take it way back to the '70s, when we had Flag Day. We came to rally in a circle," he said. "Now we've created this because it's a blessing to see everyone together." He then spoke a few words in Samoan, before continuing in English. "'All My Usuos' stands for all my brothers. 'All' defines all different cultures. It has no race on it. All you guys are my brothers. No matter what walk of life you come from, you are all my brothers. It's not just about being Polynesian, but it is important to remember who you are and where you come from." After a few more words in Samoan, he passed the microphone to a gentleman named Pastor Lucky, who said a prayer for JT and Jungle Joe, quoted Mathews 5:16, and then blessed the food for everyone in the park—including the people who brought a Raiders tent. As I stood in line to get food, someone asked, "Who made the potato salad? "—and my heart warmed. If my eyes had been closed, I would've thought I was at my own family reunion. It had dawned on me: Melesaine and I aren't too different. With her ever-present camera, she's a documentarian of a community that is in flux. 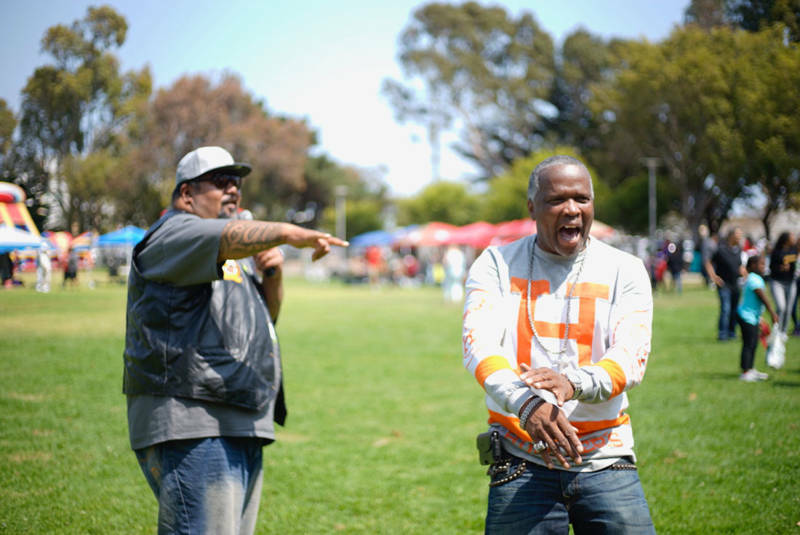 A significant number of Samoans in San Francisco live in the same projects that house a large percentage of its African Americans, and they're going through the same battles of gentrifying forces from the outside and community violence from within. Talking with Melesaine, I learned that a lot of Samoans are Mormon, far from their indigenous religion; similar to how a large percentage of people with African lineage are disconnected from our indigenous religions. In fact, Melesaine's father originally came to the states to plant the palm tress that line the Mormon Temple on the hillside of East Oakland. She also told me that a lot of Samoans from American Samoa (not to be confused with the Independent State of Samoa) came to the mainland United States in order to get involved in the armed forces; that's how a large number of people ended up in Bayview and Hunters Point, which is adjacent to the now-defunct Navy Shipyard. Even her "Polynesian Panther" shirt was a sign that our ancestral roots come from land that sits on two different oceans. But like myself, Melesaine is a student of the streets as well as the classroom. While our childhoods were spent on two different sides of the Bay Area, our struggles aren't too far removed. Days later, the unfortunate news came the Jungle Joe had passed. 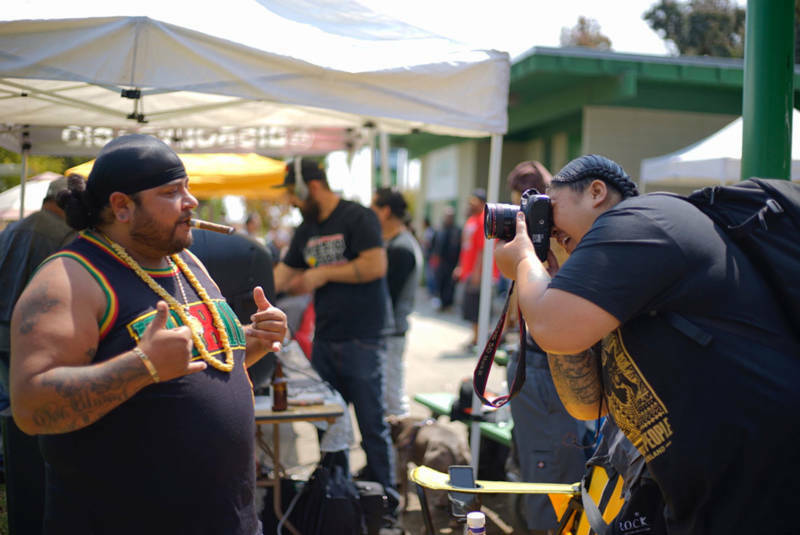 The very next day I got word that Prince White, an organizer and activist in my community in Oakland, who'd been in the hospital battling a very rare autoimmune disease, had succumbed to his illness. In addition to being a father and a husband, White worked with the Urban Peace Movement and led the DetermiNation Black Men's Group, "tailored to support young men who are struggling to advance in their own life goals and who have been formerly involved in or are currently in close proximity to the 'street life.'" 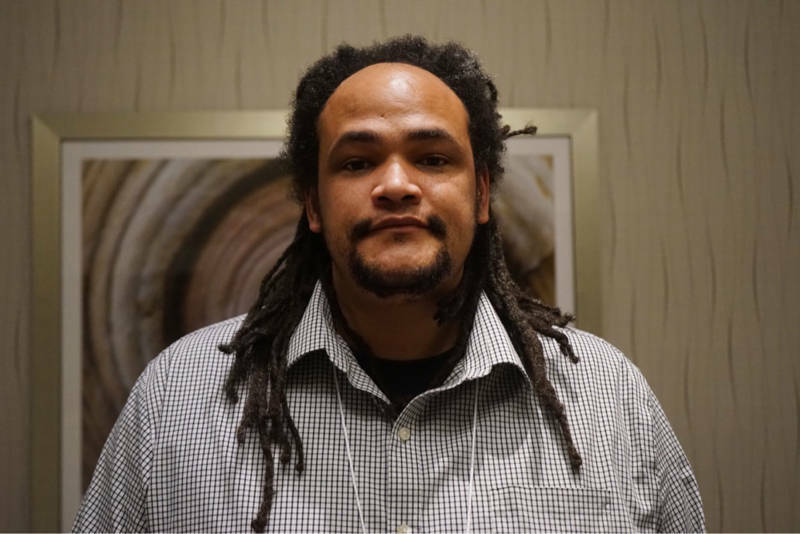 White also worked on the 1,400 Jobs for Freedom Campaign in Alameda County to employ the formerly incarcerated, and avidly fought for the release of a young man named Dajon Ford, who was arrested at age 17 but tried as an adult. I knew White for only a few years, and I never met Jungle Joe. But I see parallels in their stories; just as I see commonalities between Melesaine and myself. When I got word that White had passed, I went into my photo archives. I knew exactly where my photos of him were. I shared them on social media with words expressing condolences to his friends and family. When Melesaine got word that Jungle Joe had passed, she did the same thing.